Coach Din Thomas opened up recently about what 2019 holds for UFC welterweight champion Tyron Woodley and included in said plans was a showdown with former interim champ Colby Covington. Colby has been trash talking and calling Woodley out since before he won the interim belt – to no avail. Up until now Tyron has refused to fight him for whatever reason. Thankfully we may finally get to see just how good, or just how full of hot air Colby is. Here’s what Din said to BJPenn.com. Colby does deserve the title shot. Tyron had to eat it for two years, Colby’s been poking him with a stick for two years and he’s earned it, and we recognize that. Colby beat everyone in front of him, he won the interim belt, and said what he said so Tyron was ready for him but then Usman came along. Usman in his own way earned the right to fight Tyron but we felt he should’ve gotten in line. At the end of the day, it doesn’t matter to Tyron. Tyron said he’s going to fight both of these guys, it doesn’t matter who’s first. Unfortunately, Tyron doesn’t get to pick who’s first, the UFC does. They put Usman in, what’s done is done, and after Usman, hopefully it’s Colby. We aren’t going to complain about it because he planned on fighting them both anyways. What do you think? 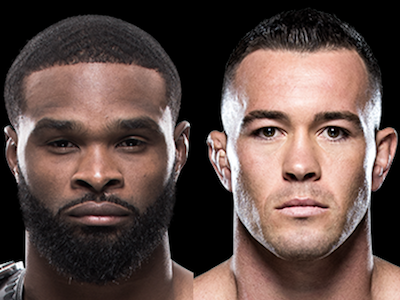 Can Usman or Covington dethrone Woodley?